I lost my sweet boy, Biscuit, on Saturday. He died in my arms after spending 2 days in intensive care. The guilt and regret I have over how his life ended seems insurmountable. So much I wish I could change. He spent 2 days in that cold, awful place rather than at home with me. I had such hopes that he would pull through and life would return to normal but instead he died an agonizing death right in front of me. I will never be able to get those images of him gasping for air, gasping for life, out of my head. They haunt me daily. I cannot close my eyes without seeing them. Cannot lay down to sleep without pills. Cannot wake up without tears in my eyes and the ache of emptiness in my chest. Life will never be the same with my precious boy. It just isn't worth living without him. There is no purpose anymore. Only the quiet, lonely stillness all around me. 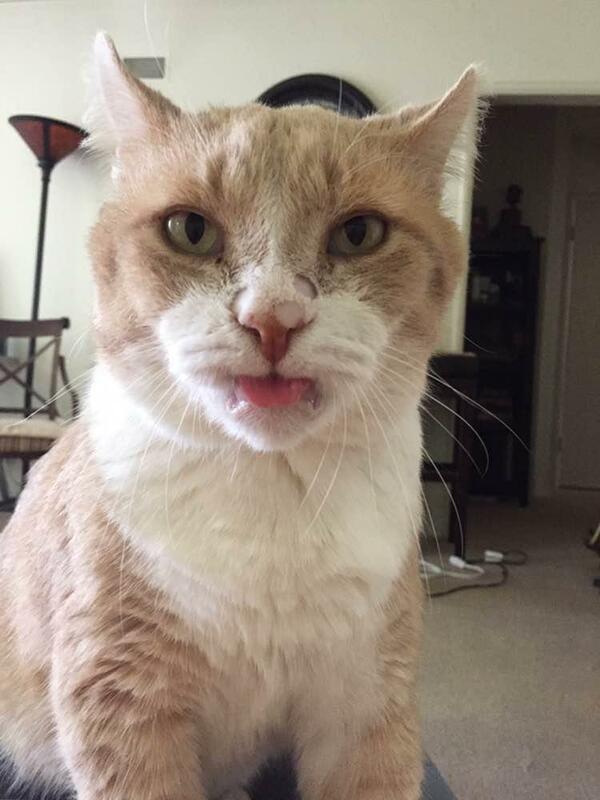 Biscuit was a cat who will never be matched. He was special. He was perfect. We were best friends. We were soul mates. And I let him down. How he must have felt utterly abandoned at the hospital. Where was I? Why did my dad leave me here? Why are they sticking me with so many needles and forcing medicine down my throat? I cannot forgive myself. I cannot get past this. I cry all the time now. When I'm not crying I wander around my apartment in a daze. The world is an ugly, lonely place without my beautiful little boy by my side. I already responded to you on the other site...your little Biscuit is beautiful and your devastation at losing him is palpable. I'm sorry you are hurting, I wish there was some way to get through this without so much pain but I have yet to have found it...even years after my losses the pain of missing them is still so great. Somehow we learn to adjust and survive, but not easily. Oh, dear, BiscuitsDad, I'm so very, very sorry for your loss and pain. Your dear Biscuit looks like such a sweet ginger boy, and even his name is special to me as well because I later came to adore another cat who wasn't technically mine (his and his brother's people wouldn't allow us to adopt them), but who I also still grieve over and had actually re-named "Biscuit." Yours and your furboy's story moved me on so many levels, because it's quite close to mine and my boy's story, too, and I can only hope that may help you feel like you're not totally alone in the terrible state this has left you in. You displayed great courage in telling your painful story here, so I hope you can at some point acknowledge and respect yourself for that. Just about everything you said here, I've felt and said myself. I truly resonate with the utter agony of it, and am able to re-experience a now somewhat softened version of it in a nanosecond, even to this day...but I do try not to as much as I can help it. Unlike your story though, despite being right at my beloved boy's side and still at home, I was not even able to hold him in my arms in his final moments, nor even for hours before...yet another aspect that still haunts me no end, it was just so "wrong," given how such closeness had always been a given between us. So I envy you that gift. My boy fully knew how immensely and endlessly loved and cherished he was, and like you and your Biscuit, he, I, and his sister were all soulmates. Still, these kinds of "if only's," the wishing for every purrfection in the past, linger. But like your story, those horrifying moments of gasping for air...no, I don't expect those will ever dim from my memory. My heart just busts apart for any of us who experienced a less than "peaceful" or "easy" transition for our beloved furbabies, when they deserved only the very best from life. Yet we cannot, and I say even should not forget the pain, either, as that would be a disservice to both ourselves and the lessons we learn through our beloveds' precious lives. However, it's best if we can learn how to move through and past as much of our guilt as possible. There are different types of guilt though, which that course outlines and helps you work through in depth, as well as addressing the task of self-forgiveness as much as possible. You're right about this -- life will never be the same after such great loss. How could it? And as kayc said, we miss them every day. But then, why wouldn't or shouldn't we? For me, my furchildren were and still absolutely are the biggest, most meaningful and most spectacularly miraculous loves of my life, for so many reasons 💖, so missing them so deeply seems a very fitting and honourable way to feel. It also helps me feel and recognize how bonded and connected we remain, even after death. I'm so so sorry that you lost your sweet Biscuit kitty. 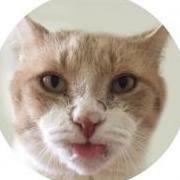 It is such pain to lose a best friend, I just lost my Buster cat (who was a ginger like Biscuit). It's been two weeks and it is still a deep pain in my heart. I think I hear him in the other room and I get excited but then remember. It's really so difficult, sleeping is hard. You're not alone in this feeling. I had to put my baby to sleep, and still feel guilt around the decision. He had a terminal illness and would not recover without massive surgery and chemo and painful invasive intervention. Even then, my doctor said he would likely not live another year at the very most if in the unlikely event he even survived the first surgery. We found out after bringing him to the emergency ER after he couldn't breathe at home. Watching him have difficulty breathing was so, so awful. He had to stay in the ER overnight, and the pain was so real thinking of him there, so I know at least a little bit how that feels. Remember though that it is very likely Biscuit did not give you any warning that he was as sick as he was. Cats are experts at hiding their symptoms. I too am having flash backs to the night at the ER and when the doctor came to put him to sleep. It's awful. One thing that helped me is printing out some pictures of him and framing them. I have a little ritual where I light a candle and look at all the pictures of him happy and healthy. So much of Buster's life was happy and healthy, as Biscuit's was too. I hope that soon those memories will slowly replace the traumatic ones. Please be gentle with yourself and try to comfort yourself knowing that you loved your cat so much, he was so lucky in life to have you. I'm so sorry for your pain and loss. I can tell that Biscuit was an extremely lucky cat to have you in his life. Your story of losing your sweet Biscuit has me weeping. I lost my sweet girl Bailey on March 25, my English Springer Spaniel, and I’m so lonely and feel like my heart has been shredded. I’m so terribly sorry for your loss. It sounds like Biscuit was truly your best friend and honest soul mate. Bailey sure was mine. I just couldn’t be more sorry and am extending my deepest sympathy. I wish you were my next door neighbor. I would have you over to bring pictures of Biscuit and tell me some stories about him. I know how desperate I feel to talk to someone about my girl. She had the prettiest big brown eyes. The love you have for Biscuit makes me know that you gave him a great life! 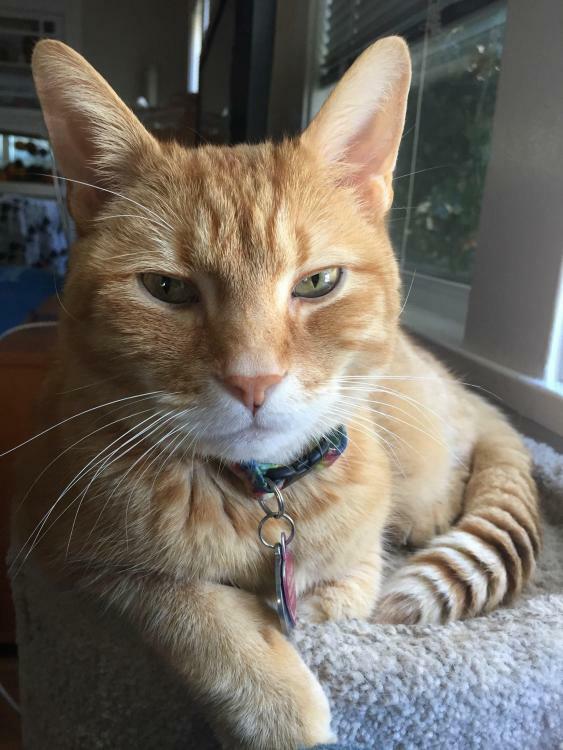 He won a kitty lottery to have been loved (and maybe spoiled) so very much. My Bailey was with me 24/7 for the past 11+ years and I’m trying to be glad for how much we were together, but that is what makes now so painful. I hear the same in your story. We don’t know how we can go on without them. And, we don’t want to because the pain is so bad. But, we need to. I know you were a great and loving “dad” to Biscuit and he was sure lucky to have been yours. I’m really sorry for your huge loss. I'm very sorry for not replying sooner, I was not getting notifications. I so wish I had seen your replies sooner. Thank you all so much KayC, Maylissa, Buster's Mom, and Bailey's Mom for reading my story and taking the time to respond. I am so very sorry for your losses. Your own stories, kindness, and thoughtfulness made me cry. We loved our little fur babies so much. Facing each day without them is so difficult, seemingly impossible sometimes. I still wish for my Biscuit boy back. I talk to him like he is still physically here and say to him the things I would normally say. "Hey my Bisky-boy, ready for bed? C'mon, let's go to bed, my good boy." And as I lay in bed and try to imagine him settling in beside me, his physical absence crushes my heart. But as you all are doing and as I must, we have to face each and every day, face the "new normal". This past week more than a few times I've wanted to give up. Wished I was dead. But here I sit, reading your stories and crying again. I'm facing the day as hard as it might be. Thank you all again for your kind words and for sharing your own stories. It helps me more than you might know. Your thoughtful words as well as those of others online have literally saved my life. BiscuitsDad, I’m so glad to see you came back and know that others do get what you’re going through. I’ve had those same thoughts of wanting to give up on life, but my faith and adult daughter will keep me here. Do you have friends or family you could spend some time with? Or a local coffee shop that you might hang out at a bit, just to be with others some? I had a couple who came over for about an hour a few days after my Bailey passed away and it sure was nice to be with them. But that night the grief was a deeply painful and agonizing as all of the others. I haven’t seen anyone else. I can’t do those things. I’m disabled from a neurological pain disorder and it has limited my time that I’m able to stand, walk, or even sit with my legs down. Plus, right now driving isn’t possible even for short trips I use to make for groceries and things because I can’t see well enough due to cataracts and can’t have surgery on my eyes until my diabetes is under much better control. I was just thinking of what might bring you some comfort and for me that would be caring people, but we are all different. When Bailey hadn’t eaten in 2 weeks except for twice when it made her sick, I had to make the torturous decision to let her go. I know you’ve had excruciating pain and guilt, but so do I. A vet came to my home who was as sweet of a person as I’ve ever met and she sat with me and with Bailey for an hour, loving on Bailey and comforting her. But later that night I wept like never before in my life that has been full of loss for the past 25 years... and I cried out to Bailey and felt like I’d murdered my best friend! No situation of losing our truly best friend can be a good circumstance, can it. I wept as I read your first post because I had the exact same feelings. Bailey snuggled up against me at night and I LOVED it so much! I loved her so much. She was the best friend I’ve EVER had. So loyal and sweet and funny and very cute. My daughter wants me to get another dog, but it wouldn’t be Bailey. One thing I wanted to share with you was that the vet who came to my home was from Lap of Love, and they have a link to pet grief resources like phone counseling and groups for pet grief, as well as other possible helpful ways to cope with the loss of our fur babies that we love so very much. I thought you might go to Lap of Love’s website to click the links and see if anything might help you a little bit. I’m going to call tomorrow. I just have to. I’ve been up all night every night weeping and crying out to Bailey. It sounds like Biscuit was a wonderful friend and I know our pain will not be quick or easy for us to get through, but please just keep taking steps. I’ll check back here to see how you’re doing if you keep posting and I hope you will. It sure seems like there are very caring people here and I’m grateful for this site. There’s something of a balm that comes from others who care and understand. "Hey my Bisky-boy, ready for bed? C'mon, let's go to bed, my good boy." And as I lay in bed and try to imagine him settling in beside me, his physical absence crushes my heart. You know, it's okay to do this, and who knows but what he may hear you. So much about the life beyond we don't know. My husband has been gone 14 years come Father's Day and I still talk to him, "think" to him, and he's on my heart and in my mind every day. I so miss all of the animals I've lost, some who didn't even belong to me. I know this is hard and my heart really goes out to you. I am also so glad you came back and are getting at least a little comfort from knowing that others are going through this with you. It's hard to talk about with people who don't know what it's like. Biscuit (and Buster) were so much a part of our every day lives and gave us so much love and comfort. Some people might not really understand, so it's comforting to me to know through coming here that there are some people who do understand what we are going through. The "new normal" IS really hard to adjust to, and you are very brave every day to actually allow yourself to feel this loss. It's okay to grieve, I think our culture likes to sweep things under the carpet too quickly. I went to a pet loss support group soon after Buster died and it was likewise really helpful in getting some understanding and comfort face to face. It helped me to really understand that I was not alone. I'm not sure where you live but here is a good listing of nationwide resources and state-by-state listings of local pet loss support groups. If you want to share pictures and stories about Biscuit here, please do! 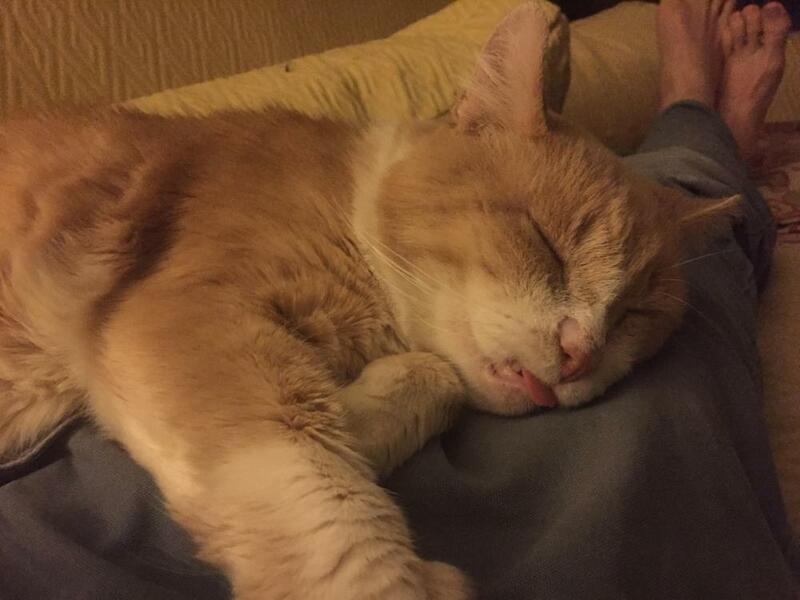 I'll include a picture of Buster and say that he was a feral fellow that found me in Baltimore and was a hard guy at first because he bit and scratched, but over the 16 years I had him he truly became a lap cat and a sweet boy. He would sleep on me and purr every night and every morning. 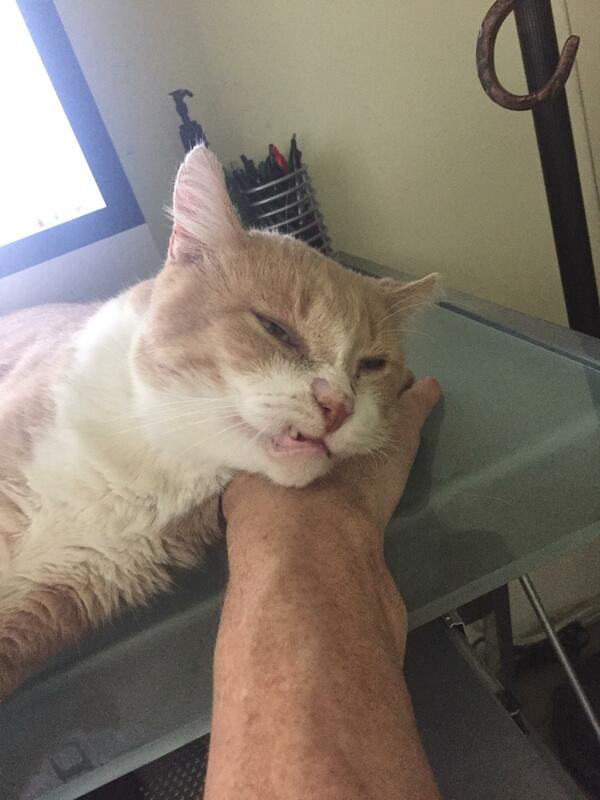 I would stick my chin out and he would rub his cheeks on my chin and face as a greeting. He was the best lil guy and my best friend for 16 years! Please feel free to share pictures and stories about Biscuit if you feel like it would help you, we're here to listen! Thank you all so much, Bailey's Mom, KayC and Buster's Mom. I've been having a really bad couple of days but I'm getting through it. I read your posts the other day but in tears was having a difficult time composing myself. Today is the 2 week anniversary of Biscuit's passing. It will be a hard day I'm sure. Your stories and your kindness help immensely. I wish none of us had to experience this loss and grief but I'm thankful there is a community of people who understand. I've found a chatroom on another site that has helped a great deal. I also have a pet loss support group on Tuesday. This has been a grueling, unreal procession of days. For now I'm at least able to work again. Mornings and afternoons are still difficult. Working from home makes it harder to distract myself when everything reminds me of Biscuit. But thanks to your kind and thoughtful replies, I am getting through my days when otherwise I don't think I could. Buster's Mom, Buster is so handsome! Such a beautiful boy. 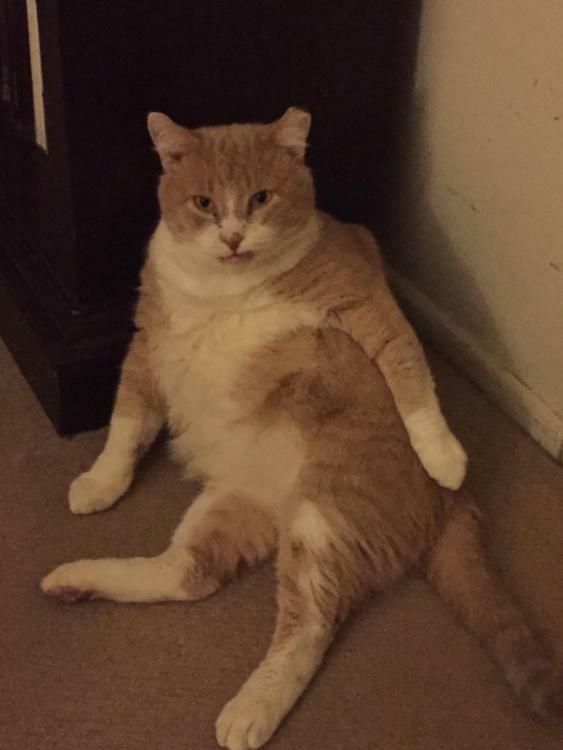 Biscuit would not win any awards on his looks but I personally found him to be the cutest big boy ever. He had such a quirky personality and just a look from him could make me laugh. I just miss him so very much as I'm sure you all miss your fur babies. Here are a few of my favorite Biscuit Boy photos. I had to laugh, I have one with an identical pose from Kitty! I love the tongue sticking out too, so funny. Yes they provide joy in our lives, and we sure miss them when they're gone. I'm glad the chat sessions are helping you and I'm sure you'll find the grief support group of immense help. Let us know how it goes. Sending you comforting thoughts. I agree, we do not want to relinquish that love. And we don't have to. And of course there are no "substitutes" for our beloveds. As rightly said, even if more love comes our way, it is always "something else," and not what it was before. Even so, my heart was yearning for at least that "something else." Now I'm going through another grief of a similar nature, over another cat from afar who I unexpectedly and immediately fell in love with, because she is nearly the spitting image of my beautiful boy, and has his personality but my furgirl's voice, and other such marked similarities. Sadly, I wasn't in a position to adopt her and her very similar mother. They were totally bonded with each other, and for good reason, I don't believe in splitting up bonded pairs of animals. Now they've been callously separated, each ripped away from each other and adopted out to different homes, and the daughter-cat also doesn't have any other furry companions now to help her through this, either. So actually, I'm grieving more for each of them and their grief (non-human animals do also grieve the loss of their own close relationships), even more than my own over having lost this chance to give all 3 of us happier lives. Sort of a triple-whammy grief of a less common nature. It's all making me dream of my own furkids on a nearly nightly basis again...at once ambiguously painful, yet also soothing. 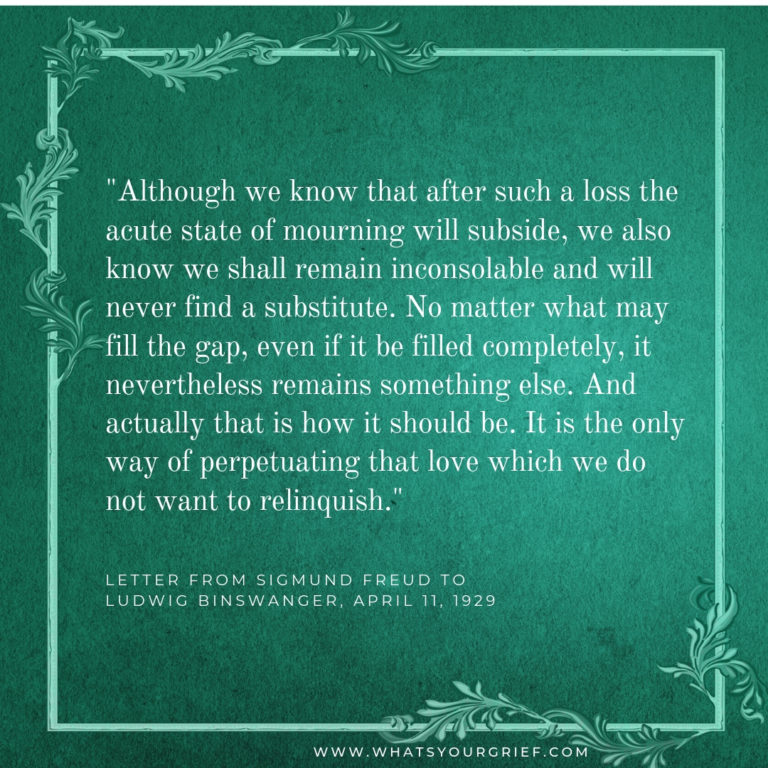 So while many people recoil from the idea of holding even tiny vestiges of the pain of loss, this article and its accompanying quote gives us permission to do exactly that. In some way it can be a sigh of relief, taking the pressure off to "hurry up and heal," and for good, so as to never "bother" anyone with our pesky feelings 🙄. At least on some level, I never want to forget, nor leave 100% of these pains behind. They give me the ability to be compassionate, and without them I might lose the seed of those hard, yet otherwise affirming life lessons, as well as the ability to empathize deeply with others' losses. And having also personally experienced the frightening opposite in others, I'll take the value of being able to feel that pain, instead of coldheartedness, any day. It means I suffer much more inside than they do, but there is also some merit to that. I hope this kind of broader perspective might in time help you carry your loss a bit less heavily, and add honour, self-respect and worth to what you're having to go through. I, too, am glad you've been reaching out and finding whatever help and support you can. Without forums like these, and other resources, I would have totally lost my mind. Thank you, Maylissa. I appreciate the article link. I will read that. Hopefully it will help. And thank you for your insights and wisdom, thoughtfulness and kindness. I especially need that today. It has been an especially hard day today. I'm either crying or on the verge of crying most of the day. I have so much sadness and emptiness in me. I'm just so unhappy and lonely, my life has become so quiet and still and utterly pointless. I'm so sorry to hear about the mother and daughter kitties who were separated. I don't understand why they couldn't remain together. People can be so cruel and unthinking. I can only imagine how depressed they each will be being separated like. And the daughter-cat will be alone, possibly all day while whoever adopted her is at work. That just makes the story even more tragic. I wish you had been able to adopt them. Stories like this just break my heart. I wish there wasn't so much callousness in the world. Thank you again for your reply. Like all the others, they help get me through my days when otherwise I'd just lay down and give up. Hi BiscuitsDad. You're most welcome, and I hope it helps in some small measure. Grief support tends to have cumulative effects, over the long term, I've found. But I can certainly imagine where you're at right now, especially since it's only been a couple of weeks. I remember all too well how utterly devastated I was myself, especially after we lost our girl, who was the last to transition. Prior to that, I had to go on, because she was still here with me. My heart just breaks for you, over the crying/near-crying, sadness, emptiness, unhappiness, loneliness, the quiet and feelings of pointlessness. Truly, I felt the same way, and cried all through the days, until I got numbed-out or too exhausted for tears, but only for brief periods. Just staying alive was such a struggle...and I didn't want to stay alive, either. It's excruciating, and even that word doesn't do deep grief justice. At my bequest, we went on a short, local trip soon after losing our girl because I could no longer tolerate being in the house by myself, nor coming home to an empty place after being out. I sobbed like stink every single night on that trip (just as I had at home), thought I would have a heart attack my heart burned so terribly (and wanted to have a lethal one to end the emotional pain! ), and woke up with nightmares and sobbed some more until I couldn't breathe. The break from being in an empty shell of a home was a little relief of sorts, though of course it didn't "solve" anything. But I sure needed even that tiny bit of a break and distraction from the feelings of devastation. In the past, we had only on average gone out for up to 3 hrs at a time after we lost her brother, as she needed so much care after that and I wasn't about to let her down if I could at all help it. Even my body knew exactly when that 3 hr window was up, and it felt all wrong to stay out any longer, though I had no reason to rush back home anymore. That went on for months, it was so ingrained, and became just another form of torture. So I suspect you must be at least a little stronger than you believe you are, being able to stay at home for work! But I feel terrible for you, imagining what that must be like. That said, is there any way you might be able to get out for a bit, even for a small amount of time to take a walk, or just go sit somewhere else for a spell? Baby steps are often all we can handle, but are also cumulatively good for us. I say this also knowing how difficult it is to even go to the store, for example...where I also used to break down in tears, with all the stupid music played everywhere you go! Thank you so much for your kind thoughts about my own current grief. I truly appreciate it. The worst part about that bonded mother and daughter cat being separated...is that it was a rescue org that did that to them(! ), very UNlike how the majority of rescue orgs these days handle bonded pairs. To my mind, it's unconscionable. So yes, real-life stories like this break my heart in two as well, and I definitely share your wish about the world, particularly when it comes to animals! There isn't a tenderer place in my heart than there is for them. I sincerely hope getting responses here or elsewhere keeps helping you get through each day or each hour. I know it did for me, too. Thank you for sharing that article, I love What's Your Grief and often share their articles with my grief support group. In their article, they linked another article, Ongoing Relationships, and I saved that one to share...it's true, we learn to connect with the one we lost in another way, through memories, pictures, talking with them, thinking of them watching over us, etc. We continue our relationship with them in a new way. That has helped me not just think of how I've lost them, but how I can keep them in my life still, which is consoling. You have a very real bond with Biscuit and it's my hope that you will be able to think of him as not just gone, but incorporate him into your life in a new way so that you don't only feel the loss but realize your relationship is ongoing, if that makes any sense to you. That has helped me tremendously with the many losses I've had in my life of those closest to me. We still miss and long for the ways we used to be able to interact and that loss is still keenly felt but it's comforting to think of them watching over us and knowing nothing can steal those memories we share. Maylissa and KayC, reading what you wrote was so helpful to me, thank you so much for your thoughtful words. I especially am trying to think of ways that I can incorporate my Buster into my everyday life. A good friend suggested that after we had to put my baby to sleep, that we get out of the house and do something in nature. We took a hike up a big hill that Sunday, me crying all the way. As hard as it was, there was some magic in it too. There is a little stone circle in this place at the top of the hill, and at the center I found a small pink glitter heart that looked like the heart on Buster's collar. There was a rainbow around the sun too. Yesterday evening I took the same hike, crying, but it helped me to feel closer to him. Maylissa, I'm also sorry to hear about your sadness around the separation of the kitties. I'm sending good thoughts that they adjust well and are loved deeply. It's so sad. Finally, Biscuit's Dad. You said Biscuit wouldn't win any beauty contests, but I beg to differ! I love love LOVE that picture of him with his sweet little pink tongue sticking out of his mouth. He was so very handsome and you can tell from the pictures just how much he loved you by how relaxed and comfortable he looks. It's truly a special thing to be chosen by an animal. It reflects that you have a giving and generous heart. Being just three weeks out of missing my baby, I feel deeply the ache in the heart that I'm sure is familiar to you. I'm sending all the love and support I can. Please feel free to continue sharing stories of Biscuit, pictures of his handsome face, and how you are feeling. We're here to listen. BiscuitsDad, even today, every time we go away anywhere, I still ask my kids to be with me for the whole time, and so far, I have not failed in getting a meaningful sign of their abiding presence. They definitely found their favourite ways and forms to send their signs, and some are like clockwork now. It always makes my heart burst with love and smile in gratitude, even if I still might feel weepy at the same time. I read a LOT on this subject afterwards and that was one of the most comforting aids I found...as well as reading about human child loss reactions in parents, because I could relate so well to that, too, since my furkids were/still are/will always be my furchildren. Word to the wise, though, I'd advise to never publicly try to connect with those parents on that level, as they find it horribly insulting and can't relate to the equality of pain levels/thoughts/reactions, due to this society's prevailing attitude that it's still "JUST an animal." But the writings might help you, regardless. As for receiving signs, unlike what the majority of the literature claims, I personally have NOT found I necessarily needed to be in a calmer state to receive them. In fact, the most spectacular signs have actually occurred for me when I was the MOST upset! I have only ever needed to be open to believing they could send them, and having that desire. Because of the vast love between us, I've always received far and away more signs from my kids than from any human family member who has passed...how I prefer it anyway. We took a hike up a big hill that Sunday, me crying all the way. As hard as it was, there was some magic in it too. There is a little stone circle in this place at the top of the hill, and at the center I found a small pink glitter heart that looked like the heart on Buster's collar. There was a rainbow around the sun too. Yesterday evening I took the same hike, crying, but it helped me to feel closer to him. I hope you took pictures to remind you of this time...I believe it was meant for you to be there and see the heart and the rainbow too! I'm glad you felt closer to him as you again took that hike. One of the best ones from my girl actually had the power to make me LAUGH OUT LOUD awhile later, it was so darn apt for how hers and my life was together over her last 6.5 years! That is a good moment that you can realize and smile about. And I too disagree about Biscuit winning photo contests. I think he's beautiful and I've always wanted a cat that looked like him, maybe someday. It has been said by many that our loved ones really aren't "up above" or any of those older ideas, but often only ~3 feet above ground level, and most people just can't see them, but they're RIGHT HERE, ALWAYS, and we've just forgotten HOW to see beyond the earthly physical. Yet LOTS of folks even physically see them pop in & out, or see them rather like 'shadows' out of the corners of their eyes, and the like. It's a real help to read up on all the ways they can show up, so that you're prepared in case it ever happens, and then you can recognize it straight away, without having to wonder or think you're just "going crazy." And please don't be too quick to discount those sounds in the other room that you'd mentioned, either -- they may be REAL sounds from Buster!!!! The BEST EVER signs I got were of that nature, and my girl and I shared in witnessing several of those from her brother, so I knew for certain what we clearly heard together was actually him!! (I'd probably written about these here if you want to search, most likely for "ADC") By contrast, my H didn't hear any of our boy's, BUT, was the only one who heard one from our girl, which was SO loud and clear to him that he'd thought it was ME doing it on purpose to fool him! Regarding that one, it was very interesting, albeit very upsetting to me, that he heard that sign at pretty much the same time that I got a different one from our girl! So yes, she was certainly working hard that evening to make sure we were BOTH aware of her presence, bless her hugely loving heart! In reality, we are ALL mainly made up of space, not solid form, and are all in this same, connected, universal "soup," which has often been called The Field, if you wish to look that up. Newer science knows about this now, but many people either don't know, or just can't or won't accept it yet. However, that makes it much easier to understand why and how these signs happen. And it's a very GOOD thing! And thank you much for your kind thoughts on behalf of these 2 bonded cats. I'm still checking on them daily via their adopter's fb pages, but still feel helpless to influence their wellbeing, so it's still a painful form of ambiguous loss. I sensed their fates coming just before it was formally announced (days after the fact), and I'm very angry about the whole matter. The only positive thing was that it was another validation of my intuition still working accurately. Had I known at the outset how toxic and ill-educated this 'rescue' society and its fans really were, I never would have been drawn in in the first place and could have saved myself a lot of grief over the last year. You may be interested to know their focus is actually on "feral" cats (TNR or adoption), but I've come to now call such cats "community" cats instead, since I've learned the term "feral" is often a misunderstood word that can make a huge difference as to their fates. These last 2 cats aren't even the first cats from this place that I came to love & adore and attempt to help, but all to no avail. As far as I'm concerned, this non-profit org. emotionally & psychologically wrecks a lot of cats, and a lot more. I personally have NOT found I necessarily needed to be in a calmer state to receive them. Yes, in fact I received one when I was very distraught and my anxiety was through the roof! Well, how excellent is THAT, Kay?! 😃 👏 I actually experienced my very MOST profound and "in your face" signs from my furkids within the first few days after their transitions, so that is how I learned this "old" information just wasn't true...or at least was no longer true. But that was many years ago, yet I still see it posted everywhere, as if it's still an indisputable "must-do." Old ways die hard with humans. But it certainly helped me trust more in what I received/experienced, over relying upon anyone else's opinion or outdated belief. And as I shared this with others through the years, it helped them to relax and realize their own huge upset couldn't potentially stop them from receiving these communications, either. Win-win! I think the main problem is that, especially when in the worst throes of grief, we just don't trust our senses, no matter which senses those might actually be. That said, there are still some forms of visits I'd always wanted but never got so far. 😕 But we have to be thankful for whatever we DO get. Mine was from my husband and it wasn't your usual "sign. I had called the social security office because they didn't show two years I worked full time and I wanted to know how much I was going to get when I filed. This lady answered the phone, a Friday afternoon and coldly flatly told me I'd get like $250/mo or something (I can't remember exactly, too low to live on). This after working all my life! I asked her to check and she refused, she told me to call the local office. I'd had to wait an hour for her to come on so there wasn't time...they were closed. It was a three day weekend and I had to wait three days before talking to someone and my anxiety was through the roof! That night I felt his hand on my shoulder/back area, reassuring me. It was unmistakable, it was a physical presence, no explaining it, but it happened! When the soc. sec. office opened three days later, they told me the correct amount. All I can think of is the lady just threw a number out there and didn't care how it affected me, she just wanted to start her weekend and I was her last call of the day. They somehow find a way to get through to us when we most need them. I have heard stories of animals giving signs as well! Oh my, Kay, what a stupendous sign! Love it!!! And how beautiful is it that, even though your anxiety was somewhat more peripherally related to your husband's passing, he still heard/saw it and responded in a way that would assuredly help you!! Physical signs among the BEST! ❤️ Thanks so much for sharing! I have heard of that happening to others although I haven't experienced it myself, how very special!